Reference number for this case: 14-Oct-54-Toulon. Thank you for including this reference number in any correspondence with me regarding this case. THURSDAY evening, around 06:00 P.M., the sky of the department of Var was quiet, when suddenly, a "ball of fire" crossed it to the direction of the North. A little everywhere in the Var it was seen, and, as of 07:00 P.M., phone calls followed one another. Too many "tall stories" already circulated on the "unidentified flying objects", therefore we carried out a meticulous survey, requesting clear testimonys, coming from serious people. As we will see, these testimonys all agree. We also asked the weather station if a balloon had been released or if one had recorded a fall of meteor in the area: the answer was negative. That evening, an unidentified flying object evolved in the sky of the department of Var and Toulon area. The first person we interrogated is Mr. Paul Fatici, living in the H.B.M. of Rodeillac. "I have a shack between Rivest and Le Barrage. Thursday evening, it was 06:00 P.M., when closing my shack, I saw a ball of fire in the sky, coming from the East and moving towards Coudon at a considerable speed." - Can you give us more details? "I saw it big as that. However I am still skeptical!" with illuminated lines resembling exhaust pipes. The unit seemed to be 50 cm length on 15 broad, relative measurement." Mr. Faticci seems a little moved when remembering this phenomenon. "I saw it well, it was going towards behind Le Coudon." We rush towards Solliès-Ville. There, indeed, Mr. Olivier Baptistin, former city council man, had also seen the "ball of fire." "It was approximately 06:00 P.M.. I saw a craft of reddish color, emitting like flames at its back, moving horizontally, then to suddenly dive towards Solliès-Bridge by extinguishing all lights. It seemed to be at a thousand of meters of altitude and moved towards North. It did not make any noise." We were then kinly lead to Miss Marie-Louise Ramel and of Miss Pierrette Fillon, whom both at the same time saw a fireball evolving in the same manner "without noise, more quickly than a jet, at an altitude of a thousand meters approximately and without leaving traces." We leave to search for Mr. Thivelle, who first saw the flying object. Unfortunately, he was not at home, therefore we must satisfy us by reproducing his former statements: "it was not a shooting star or a luminous phenomenon. The broad luminous disc left around itself and behind itself a phosphorescent halation, iridescent." The name of three witnesses was then indicated to us, we hasten to join them. "As lately as yesterday, I still laughed at these stories, but phenomenon that I saw worries me extremely. It was 06:15 P.M., we were chatting with Mrs. Maroselli, my neighbor, when suddenly, I saw a kind of ball of fire moving at high speed of the sea towards the mountain in the sky. In two or three seconds, it disappeared behind Faron, while going up slightly, emitting green, red and blue colors." Mrs. Evelyne Maroselli, residing at the 128 of the same street, who was present, confirms this statement. Her son Jean-Claude Maroselli is eight years old. He also saw the machine and was extremely disturbed by this strange vision. "Here's where we saw it." 1) It is not a weather balloon, as we already said. 2) It is also not a meteor. 3) Concordant descriptions we collected make it possible to eliminate the case of a jet. 4) An optical phenomenon could not be seen from different places in the same manner; moreover, the sheaves of fire described by the witnesses make it possible to regret this assumption. Can we thus conclude to an "unidentified flying machine"? I believe that this became reasonable. Does it come from the earth or from another planet? It is still too premature to give an answer to this question. But we are convinced that the times are near, when we will be able to give an answer to this question. Thanks to the collected information, we managed to reconstitute "the shape and the characteristics" of the flying cigar which was seen Thursday evening. The machine has the shape of a short rocket, such as our draughtsman represented. At the back, the exhaust pipes which project combustion gases. It thus isn't, undoubtedly, the usual cigars which emit in theory only pale gleams and which function certainly thanks to a physical principle that we are still ignorant of. The "cigar" must be roughly 150 meters long on 30 broad, which gives it a slightly reinflated shape. In that, it resembles nothing of the very elongated shapes the rockets which we build. Able to move at very variable speeds, going up to 10.000 kilometers per hour, the passengers' cabin, according to any probability, must be pressurized and provided with a device removing the harmful biological effects of a too much striking acceleration. The body has several lines of port-holes, which indicates several residential levels. According to dimensions of the machine and the number of lines and the probable height of the cabins lit by different colors, the "travellers" must have about 4 meters in height. Their height would thus be on average the double of ours. The safety of the apparatus certainly enables them to move freely inside the cabins. How they have seen us is a problem to which it is difficult to answer. We are unaware of whether they have eyes like ours or if they move by a system of antennas similar to those of the blind fishes which live on the ocean floor. What do they do above our city? However, as until now no quarrelsome act is announced, they undoubtedly come in observation mission. Where do they come from? That's another mystery. According to the experts, no terrestrial power would be able to build such an aircraft. It thus should be admitted, until proof of the opposite, that they come from another planet than ours. But that is still only an assumption. [Captioned picture:]Mrs ROY, from La Garde, confirming with her statements the other testimonies. In connection with this article, by Patrick Gross - March 20, 2005. At the time of the 1954 UFO flap in France, journalistic fantasy reached a paroxysm and this case is a good example of that. The gap between the phenomenon as reported by the witnesses and the wild interpretations and inane speculations by the journalist is quite frightening. Here is the step by step examination of this crazyness. The headline is erroneous from the start. The journalist tells of "a cigar", but the witnesses describe a ball of fire. The journalist says that it crossed the sky, but no data in the gathered testimonys allow this interpretation. The fireball, and not the cigar, could have crossed only one quarter of the sky, or all the sky, or a small portion of the sky, nothing in the testimonys is indicative of this basic precision, the question was likely not even asked to the witnesses. The title mentions special correspondents, which seems pompous enough whemn there probably was only the journalist whi signed the article sent on the case. In any event, we have a newspaper of Toulon investigating sightings in Toulon, this requires no special envoys apart from the usual journalist of that newspaper. The title evokes a mysterious appearance. But none the witnesses speaks precisely about an appearance, i.e. something which would not be in a place at a certain time and appears at this place then. The use of a picturesque language and unjustified wording is the beginning of the journalistic disaster which is developping here. The journalist wants to get some credibility, and thus writes that "too many tall stories already circulated on the unidentified flying objects, therefore we carried out a meticulous survey, requesting clear testimonys, coming from serious people." Unfortunately, we will see that the investigation does not have anything meticulous and that its result is exactly a "tall story." The journalist notes that all testimonys are in agreement. Of course, in its imagination, there are probably two UFO types: those which are simply invented by liars, and true UFOs. It appears already clearly that he is not capable to understand that witnesses can report without lying on a real phenomenon which can have a simple explanation. In France, in 1954, we still were on the level of the US Press of 1947: the flying saucers either "exist", or they are lies. "... or [we asked] if there were recorded data of a meteor fall in the area: the answer was negative." "Did you see that car accident on highway 61?" "No we didn't." "Ah, then it couldn't have been a car accident, it had to be a flying saucer landing." And our journalist to conclude: "No doubt is thus possible: that evening, an unidentified flying object evolved in the skies of the department of the Var and Toulon." At 06:00 P.M., has "seen a fireball in the sky, coming from the East and moving towards Le Coudon at a considerable speed." The journalist is not happy with just the facts, he wants details although there are no detail. The witness is forced into making out estimates, an impossibility in this case, of "a height which appeared me be approximately from 8 to 10.000 meters," that could as well be 5000 or 40000 meters, since it is high in the sky and the size is not known and stereoscopic vision can only provide an estimate of objects at a close distance. The witness adds, "it is certainly not a weather balloon. I saw many of those and I would recognize their shape." Actually, it is not the shape which should make the difference here, it would rather be the speed. And the witness gives a sufficient approximation of it to eliminate balloons and validate a meteor; "crossed the mountain at the speed of a flash." When the witness tells: "It was not a meteorite either for it "did not fall from the sky," he expresses clearly that it is his interpretation which does not function, and not his description. A meteorite is certainly a stone which has fallen from the sky, but it is the end of a meteor flight. However meteors are perfectly able to progress in the sky without giving any clue of a fall. The essential characteristic of a meteor is that indicated by the witness, speed: "It indeed clearly crossed the mountain at the speed of a flash," and obviously if the meteor crossed the mountain it is logical that it is not seen as falling. Another characteristic of the meteors is the trail, and the witness precisely notes that it "let flamesending in a sheaf escape behind itself." Another characteristic, the brevity of meteor observations, is precisely indicated by the witness: "the vision of this machine lasted 2 to 3 seconds hardly". Still a frequent characteristic of meteors is that they are often noiseles, and the witness indicates: "it did not make any noise." Colors of the meteors are varied enough according to their composition, but they are often orange, and the witness says "the unit appeared fire red to me." Here we have a good description of a meteor sighting. He also saw a "ball of fire" and not a cigar. The color matches: "reddish," the trail is seen: "emitting like flames at its back," the trajectory is in conformity: "moved horizontally, then dived in one blow towards Solliès-Pont by extinguishing all lights." The extinction of all lights is quite natural, the meteor is hidden by the mountain. The estimate of distance is still erroneous, which is also quite natural: "it seemed to be at a thousand of meters of altitude." Silence is also reported, "it did not make any noise." Again we have a good description of a meteor sighting. Have also seen "a ball of fire", "without noise", " faster than a jet" and the evaluation of altitude is also erroneous, expectedly. Here, we have a somehow insufficient description, but very compatible with the observation of a meteor. The journalists reproduce second hand remarks, but also compatible with a meteor: "it was not a shooting star" indeed, these are often seen for less than two-three seconds and do not really resemble a meteor. The witness excludes "a luminous phenomenon", this is in way of saying that it was not a mere reflection but a realy object, a meteor which "left around itself and behind itself a phosphorescent halation, iridescent." Here, we have a second hand description, probably incomplete, but quite as compatible with the observation of a meteor. She also sees "a sort of ball of fire" in the sky, not a cigar, fast because it was "moving at high speed from the sea towards the mountain." The duration is perfectly matching: "in two or three seconds, it disappeared behind Le Faron, while going up slightly," and indeed meteors with quasi horizontal trajectory can seem to go up slightly, "emitting green, red and blue colors" quite as compatible with a meteor. Here, we have a probably incomplete description, but still compatible with the observation of a meteor. We only learn that she confirmed the account of Mrs. Maroselli. All was there to conclude that these people saw a meteor. What does the journalist conclude? "2) It was not a meteor either." No reason is given. Having probably never seen a meteor, it is enough for him to confuse meteor and meteorite, inspired by the first witness, to eliminate the correct explanation. He is a journalist, not a ufologist. The remainder shows the same absence of rigour, such as in, "3) the collected concordant descriptions make it possible to eliminate the case of a jet airplane", rather amazing sentence which provides no reason for thinking that if descriptions had been contradictory , then it could have been a jet plane. "4) An optical phenomenon could not be seen at different places in the same manner; moreover, the sheaves of fire described by the witnesses make it possible to regret this assumption." In which we have learned that an assumption can be regretted, and that "optical phenomenon" is a possible explanation to sightings and so on. The journalist assures us then that the reasonable identification is "an unidentified flying machine." Identified as not identified, sort of. Does he think that the UFO acronym is synonymous with extraterrestrial machine? No, for he tells that such an identification is "still too premature." Not so premature as that, since he continues with a series of assertion of the most romantic kind to conclude that is was an extraterrestrial spaceship all the same. "The machine has the shape of a short rocket," in other words, if it is not shaped like a rocket, there must be rockets with other shapes than rocket shapes. A trail of meteor receives an utterly laughable interpretation: "At the back, the exhaust pipes which jects gases in combustion." A comparison with other UFOs is offered: "Thus it is not, undoubtedly, one of the usual cigars which emit in theory [!] only pale gleams and which function certainly thanks to a physical principle that we are yet ignorant of." In other words, this UFO is a jet propelled UFO, contrary to the other UFOs. The journalist commits the exploit to give dimensions to the object: "must have been roughly 150 meters long on 30 meters broad, which gives it a somehow reinflated shape." And thus, "it does not resemble at all the very lonlgated shapes of the rockets that we build," a splendid pearl which slowly brings us towards the extraterrestrial rocket, which is "capable to move at very variable speeds, going up to 10.000 kilometers per hour"; which imposes a "passengers' cabin" which "must, according to any probability, be pressurized and provided with a device removing the harmful biological effects of a too important acceleration," although no acceleration was mentioned by any witness. Was it necessary to invent more details? Apparently it was, and our journalist ensures us that our meteor "possesses several lines of port-holes, which indicates several residence levels." From that, his fabulous considerations: "according to the dimensions of the machine and the number of lines and the probable height of the cabins lit by different colors, the "travellers" must have 4 meters in height. Their size would be thus on average the double of ours." "What are they doing above our city? That's a mystery." For the machine is indeed extraterrestrial, since "no terrestrial power would be able to build such aircraft. It thus should be admitted, until proven otherwise, that they come from another planet." The whole is prudently moderated via one "But this is yet only hypothetical." Do not listen to the journalists, listen to the witnesses. The "flying cigar" about which we lengthily spoke yesterday, was seen by other people who wrote to us to confirm the statements we reproduced. First it was the inhabitants of Cuers who report it. Then, Miss Janine Signorini, aged 12, living in the district of Sainte Barbe, like her brother, describes: "a luminous shape furrowed the city around 06:20 P.M., at high altitude, and moved at an appalling speed towards Ollioules." Mr. Difar, retired police officer, also saw "a cigar of fire at a 1000 meters height, projecting yellow and green sparks on the right and on the left, moving at high speed towards Coudon. The machine had a width of 5 meters and a length of 10 meters." Mrs. Arnaud, who lives 1, street Ste-Christine in Mourillon, followed with her eyes a "machine" slipping by at high speed from the harbour towards the north. "I saw, told Mrs. Fanny Beasini, aged 93, boulevard Maréchal Joffre, coming from the sea and going to Faron, at an enormous speed, a long shape, projecting lights resembling multicoloured stars." The population of Toulon and the surroundings seems rightly anxious. Are sensational events seem to be marking our time? The article is from the same newspaper and same author than the previous one, and appeared in the next day's edition. With a meteor, it is usual that the number of witnesses is quite large, and witnesses having read the newspaper of previous day naturally made themselves known. Nothing in their accounts goes against the meteor explanation. Perhaps, as Mrs. Dupont, who lives La Serinette, way of the calade, clearly saw a machine moving during three minutes before disappearing behind the Faron. What, by a simple calculation, gives this aircraft a speed of 120km/h, which is slow. However, the machine seen by the other witnesses slipped by at a vertiginous speed. It would thus seem, that it is another cigar? Patrice Seray provided his analysis of this case in an article concerning the 1954 French saucers flap such as it occurred in the department of the Var. His article is on the CNEGU ufology website and the extract is reproduced here with permission from his author. Also note that at my request Patrick Seray agreed to take the time to xerox and send to me the newspaper article which opens this file, among other newspaper articles. Introduction to flap of 1954 in the department of Var. The day of October 14, 1954 was rich for the sky of the department of Var. First, Toulon was visited by a huge cigar and then Hyères by a "saucer" and its pilot...! This provides something serious within the disorder in this department during this mirific wave of 1954. Think about it! No testimony originated from the good people of this Mediterranean country and it was thus in the trail of the other departments. Were the "saucers" being sulky? Wouldn't they like this beautiful coast and its tanning sun? In three days, this void would be filled quickly. The "ufological" fever finally seized the Var and the press headlined in large fonts. 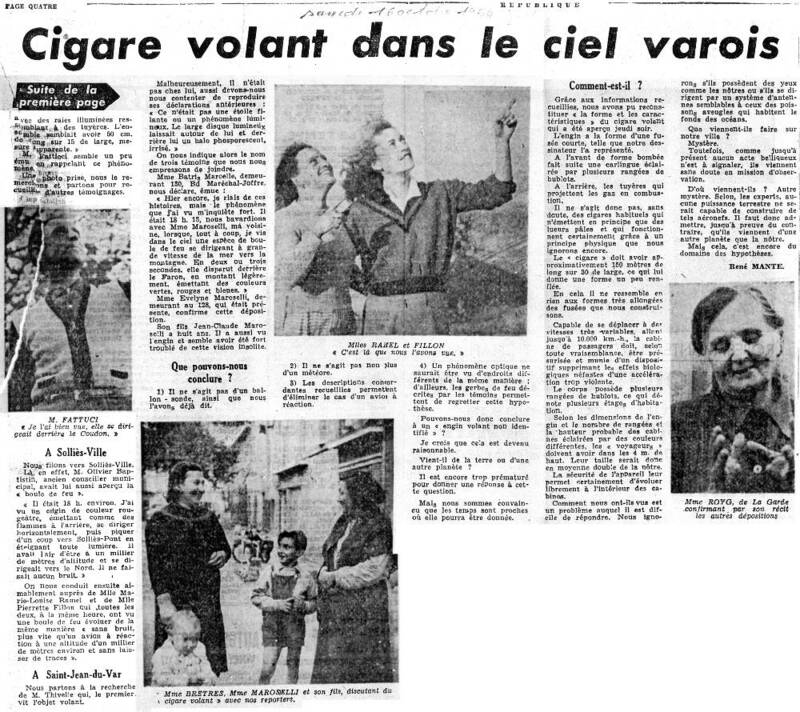 "Here is the cigar which crossed the sky of Toulon and Var"
The first two days, two headlines! And appearing in all imposing typefaces on the respective editions of October the 16th, and the 17th, 1954 in the newspaper "Var-Matin République". But what happened exactly at these precise dates? So it was Thursday evening, at approximately 06:00 P.M. And yet the sky was quiet. Suddenly, an enormous ball crosses the sky going to the north. "When closing my scack, I saw an object having the shape of a ball of fire, coming from the east and moving towards Mount Coudon at a considerable speed. In my opinion, the object was to evolve at approximately a thousand meters height. I know the weather balloons and I thus can tell you that it was hardly what I saw this evening there!" Behind the ball, this witness noticed an impressive presence of flames ending in sheaves. The unit appeared reddish. The description of this first witness is extremely simple and it appears there is little detail. However we will note a completely subjective information on his part, that of an apparent size of 50cm length for 15 cm broad. The body of the phenomenon was thus rather in the shape of a cigar than that of a ball! This same body seemed to have "lines" resembling "pipes". "It was approximately 6 o'clock when I saw amachine of red color, emitting flames at its back, flying in an horizontal manner. Then all of a sudden, it dived towards Solliès-Pont by extinguishing all lighta. It seemed to be very high. It moved towards the north without emitting the least noise." But the most interesting testimony comes however from St-Jean of the Var (Toulon) and according to any likeliness it is from there that the phenomenon was first perceived. Mr. Thivelle describes the scene in his turn in the shape of a luminous phenomenon leaving around itself and behind itsef an iridescent phosphorescent halation. Of course, other testimonys confirm the vision of a strange object there that evening! All say that towards 18:00-18:15 P.M., a sort of ball of fire, moving at high speed from the sea towards the mountain, to disappear behind mount Faron (that is in the direction of Solliès) and following a slighty rising visual trajectory, caused various reactions among the population. An object of green, blue and red colors, in the shape of a more or less elongated ball. The sketch in the newspaper article does indeed show the shape of a "cigar" or a short "rocket" with a convex shaped front end. The "fuselage" or body of the phenomenon was lit by several lines of port-holes and the back seemed in flaming. [Drawing of the "cigar", see the newspaper article at the beginning of this file, captioned:] The machine at the front page of Var-Matin. This description is extremely remote from what the witnesses report. Here the journalists of that time, benefitting from the gift, include various artifacts in order to corroborate testimonys coming from all France or they "get their fun" with the matter in a peculiar manner. According to the various information collected at the time, the journalists insist well on the fact that no really satisfactory explanation was found. 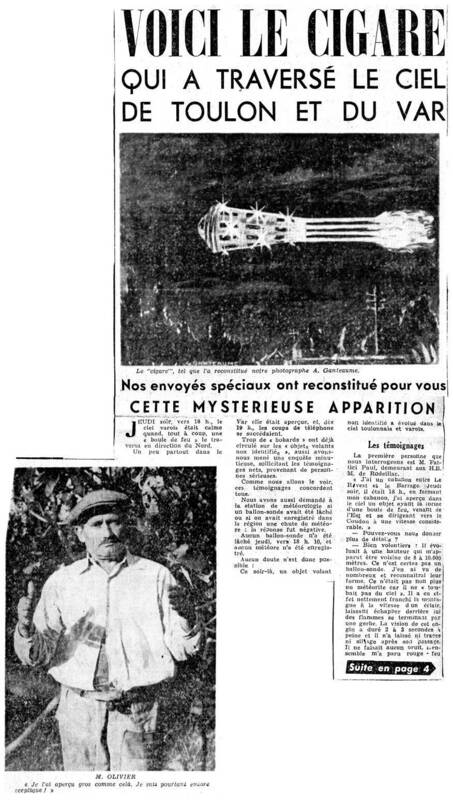 Neither a weather-balloon (none launched that evening there), nor the traditional meteorite (not located, nor foreseen by the observatories in Provence dixit the newspaper!) were the object of any explanatory attempt. These particular claims are added in an already effervescent context. Mrs. Dupont claims to have observed the same phenomenon, the same day and at the same time, according to a corresponding descriptive morphology, but with a much slower speed! Hence the conclusion of the time: "Is this another cigar?" Of course the phenomenon imposes a rational explanation, it was a meteor, sufficiently exceptional to stun the observers. That the observatories in Provence did not foresee its passage is nothing surprising! The remark is even laugheable. The journalists are surely not really unaware of this fact and probably not unaware of the real identification of the phenomenon. To include in order to enhance a little more the article in question, that a second "cigar", seen at the same time this same day but with a longer observation duration does not reject anything of conformity of our occurrence. We know by experience that Saturn, this God who governs the things of time, plays sometimes quite curious tricks in the concepts of duration conceded by our witnesses. It appears however that this non-revelation with the public will have consequences on the continuation and in particular in the minds of some people. It is a curious newspaper clipping which we put out from our archive file. 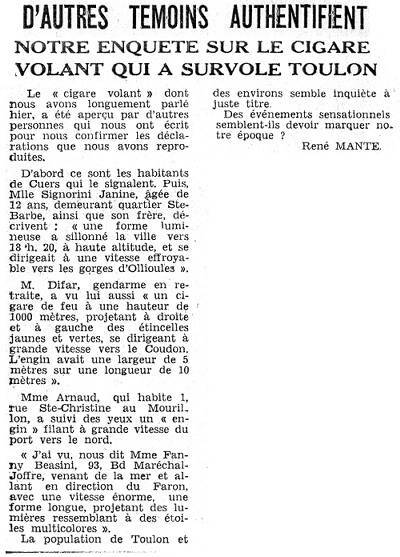 The article dates October 16, 1954 and, appeared in the columns of the late Var-Matin République. The title? "Flying cigar in the of the department of Var sky." Enigmatic. With the following subtitle as bonus. "Our special correspondents reconstituted for you this mysterious appearance." For the famous cigar is not cuban. It is an unidentified flying object which would have appeared in Toulon. Therefore very far from Havana... "This object comes from another planet"
The article, signed by a certain Rene Mante, tells with much details the trajectory of this "ball of fire" of "reddish" color. It would have been seen above Faron, above Coudon, but also in Saint-Jean-du-Var, Serinette, Cuers and Solliès-City. The article includes the many testimonys collected by the reporters, among those that of a city council man of Solliès-City, Olivier Baptistin. "The machine dove all of a sudden towards Solliès-Bridge while extinguishing all lights. It seemed to be at a thousand meters of altitude and did not make any noise", the elected official tells. Better still? It's the conclusions of the journalist, who claims without blushing that "until proof of the opposite, this object comes from another planet than ours". And to answer the question "can we conclude that it is an unidentified flying machine? I believe that this became reasonable." [vm1] Article in the regional newspaper La République de Toulon et du Var, pages 1 et 4, October 16, 1954. [vm2] Article in the regional newspaper La République de Toulon et du Var, October 17, 1954. [vm3] Article in the regional newspaper La République de Toulon et du Var, October 26, 1954. 0.1 Patrick Gross April 16, 2005 First published. 1.1 Patrick Gross June 15, 2010 Addition [vm3]. 1.2 Patrick Gross June 29, 2010 Addition [jv5]. 1.3 Patrick Gross October 20, 2011 Addition [vm4].